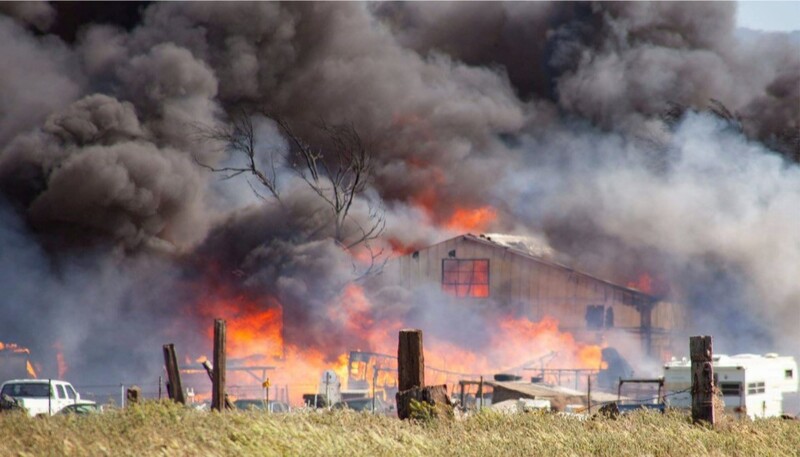 LANCASTER – A fire that started Tuesday afternoon in some brush and grass in Lancaster spread to an antiques store that was quickly engulfed in flames amid 20 mph winds, but no injuries were reported. The Los Angeles County Fire Department received a report about 3:20 p.m. Tuesday, April 9, of a tumbleweed on fire in the area of West Avenue I and 70th Street West. 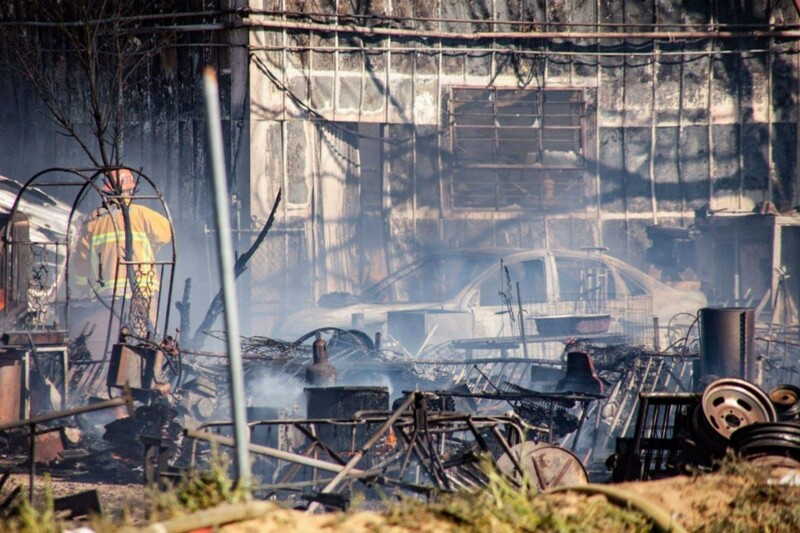 The flames spread to some grass and trees, and by the time crews arrived less than 15 minutes later, the blaze had spread to and quickly engulfed the one-story Antiques at the Barn store. 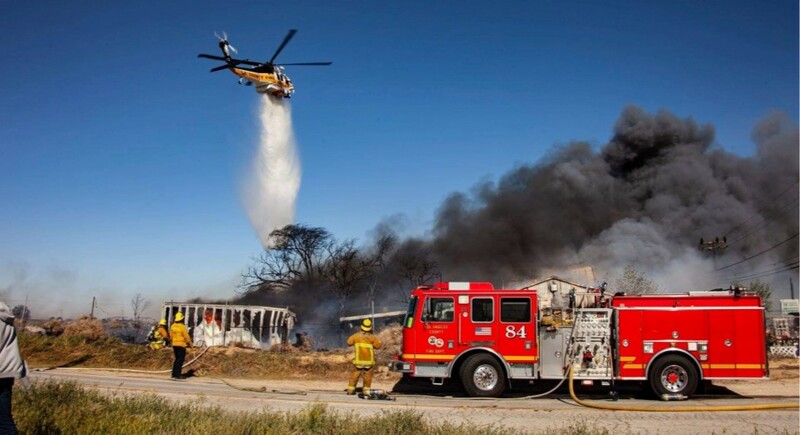 A fire department inspector said 41 pieces of apparatus, including helicopters and bulldozers, were sent to the scene to battle both the grass fire and the commercial structure blaze. Crews contended with water supply issues and were forced to battle the flames from outside the structure, the roof of which collapsed, delaying a search for possible victims. The fire was knocked down about 5:35 p.m. and no injuries were reported. 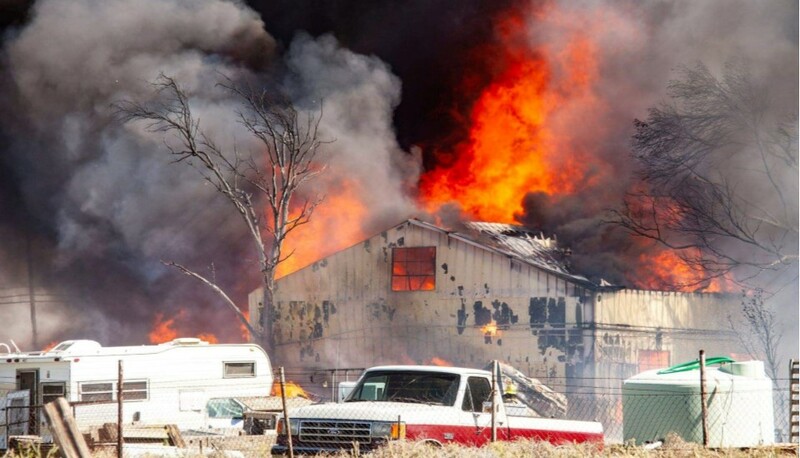 12 comments for "Wind-driven grass fire ignites antiques store in Lancaster"
Act of God? Or, the Solar panel mafia trying to clear the desert for their Infestation. Or the Pyromania guy on this thread talking smack. RIP Antiques at the Barn, I will always have amazing memories of such a historic place in the Antelope Valley. DesertedRat…For such a small community there sure are a lot of dope smokers hidden among the tumble weeds. Maybe it was one of them. I came across a few while walking my dog. Yes, there is a huge drug problem out there. To the owners of Antiques at the Barn. So sorry for your loss. We did enjoy perusing your fine business. Hope…. and hope to rebuild. Back in the 1950s and ’60s the building housed a farm tractor and implements dealership. I forget which brands were sold there. Case and New Holland possibly. There were prosperous alfalfa ranches all around that area. This is a tremendous loss to the community of Lancaster. Not only did my husband and I enjoy this wonderful place, but the owners came to our rescue after a woman t-boned us at that intersection back in 2013. Great people, Joe and Nancy, Frances, and this fire just breaks my heart. It was a popular stopping place for the annual poppy viewers on their trek to the Reserve. So sorry to see this Lancaster icon go down. So sad. Always find great things there. Hope they rebuild. To the Barn people. I’m sorry for the loss of your wonderful store. I love going there on the weekends to peruse. I hope you will rebuild. Saying ‘I’m generally concerned for our lives right now’ – because of the high winds. Would be open to sending you the video file. The place looks more like a junkyard. Word is they wouldn’t sell out to the solar industry, maybe now they will. You obviously don’t appreciate antiques. That place was wonderful and had so many amazing priceless things that have just been lost, those people just lost so much and don’t need [removed] like you leaving their two cents when it’s honestly not needed, So [removed].